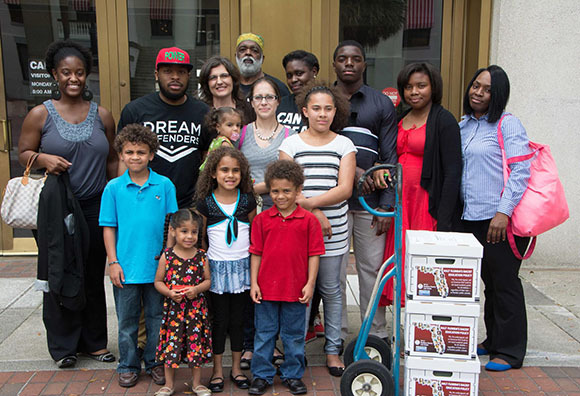 The SPLC today delivered a petition signed by more than 5,800 people to Florida Gov. Rick Scott demanding that the state stop discriminating against black and Hispanic students by setting lower academic goals for students of color. The Southern Poverty Law Center (SPLC) today delivered a petition signed by more than 5,800 people to Florida Gov. Rick Scott demanding that the state stop discriminating against black and Hispanic students by setting lower academic goals for students of color. The petition, organized by the SPLC and the ACLU, asks Scott to set equal academic goals for all children in Florida’s public schools, regardless of their race. The Florida Board of Education’s Strategic Plan sets lower academic goals on the basis of race and national origin of students. The petition was delivered five days before the 60th anniversary of the U.S. Supreme Court’s historic ruling in Brown v. Board of Education that outlawed school segregation. The SPLC filed a federal civil rights complaint in August alleging that the Florida Department of Education discriminated against black and Hispanic students by adopting the plan. The complaint, filed with the Civil Rights Division of the U.S. Department of Justice on behalf of the state’s black and Hispanic students, describes how the plan “perpetuates stereotypes that certain individuals are less capable than others based on nothing other than the color of their skin” – creating a “self-fulfilling prophecy” of lower achievement for an entire generation of students. More than half of Florida’s 2.7 million public school students are black or Hispanic. The plan sets a goal of 90 percent of Asian-American students and 88 percent of white students to be reading at grade level by 2018, but only 74 percent of black students and 81 percent of Hispanic students are expected to read at grade level. Under these goals, almost the entire population of the Miami-Dade County Public Schools district – which is more than 90 percent black and Hispanic, and is the state’s most populous school district – is held to an academic standard far lower than districts with large white and Asian-American student populations. The plan creates a risk of segregation as children of color are more likely to be placed in classes for students with lower abilities – another violation of the Civil Rights Act, which prohibits public school segregation, the complaint says. Research has shown that lower expectations become self-fulfilling prophecies. When teachers expect more from their students, they provide higher quality instruction that challenges students to meet those expectations. The Legal Aid Society of Palm Beach County is co-counsel with the SPLC in the complaint filed with the Justice Department.